Pervious concrete allowed the addition to be built, while maintaining impervious cover limits. Two years ago, PACA was contacted by a representative from The McKnight Group, a design/build firm located in Grove City, Ohio. The company had been contracted by Parker Hill Church to construct an addition onto the existing building at its Clarks Summit location and was interested in pervious concrete. Along with the installation of pervious concrete, the project also featured the use of Insulating Concrete Forms (ICF’s). The McKnight group has now started incorporating ICF’s into their project designs. Mr. Ronald Zinn, Senior Project Architect for the McKnight Group noted “In the case of the design for this project, ICF’s made tremendous sense. ICF construction creates a building that is very energy efficient, while providing excellent sound attenuation. Aspects of the building also possessed an EIFS (Exterior Insulation Finishing System) exterior. The foam that comprised the form portion of the ICF allowed us to minimize the prep involved prior to applying the exterior finish”. “The walls of the project went up very quickly, and we were pleased with the expertise exhibited by the concrete contractor, Benedict Construction. We will definitely use ICF’s for future projects” he stated. The pervious concrete was installed by Magruder Construction. The company’s pervious concrete division, out of Sanford, Florida; has extensive experience placing the material. After spending several hours on the job and talking with Magruder’s superintendent, Bruce Glaspey, it is clear this is not his first rodeo. Having placed over 2 million square feet of pervious concrete, this gentlemen brought tremendous insight with him. “Attention to detail and a cooperative effort between the contractor and the concrete supplier are critical. The mix has to be properly designed and consistent from batch to batch” stated Glaspey. “The supplier on this project, Masters Ready Mixed Concrete, did a great job working with us” he noted. Project Manager Ralph Redwine (The McKnight Group) stated that there were several challenges with the placement of the pervious concrete. Most notable was the slope that the parking area was constructed on. 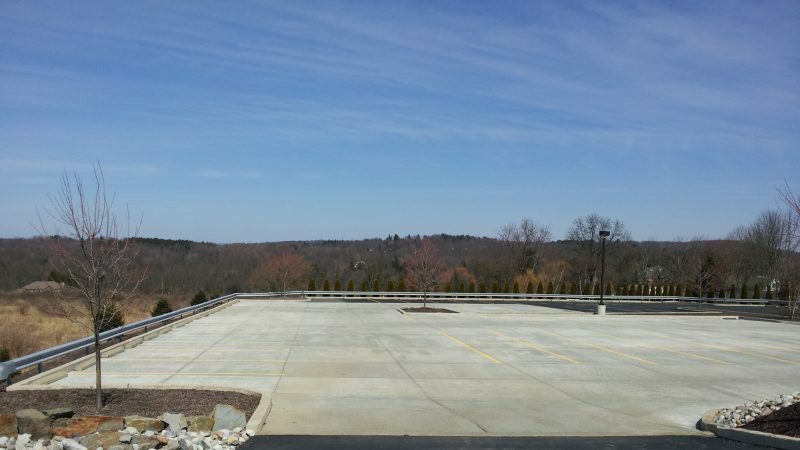 “Due to the slope of the lot, a series of dams was constructed within the entire parking area footprint. The dams provide breaks between paving sections and direct the water downward, through the system”. This installation is the first of its size in the area and will allow architects and engineers in northeastern Pennsylvania to view pervious concrete up close.